Before I even get started here, I want to note that this post's title alone would have caused Coffeepastor circa 2006 to develop a rash and go on a screaming tirade that would have ended with this computer thrown out the window. That, or he'd lose consciousness for a few minutes. Or he might just throw up his hands and yell, "Seriously?!" Or he might just roll his eyes and sigh. The point is that his reaction would be negative. You see, during my first few years of ministry, I quickly noticed all the ways that institutions--particularly churches--get in their own way. Many churches still use an organizational model that has been around at least since WWII, when soldiers came home, families and subdivisions popped up everywhere, and that generation began socializing like nobody's business. We have all sorts of social and civic organizations (e.g., the Rotary, lodges named after all manner of animal, etc.) because that generation wanted to organize themselves in a particular way to enjoy each other's company, and to serve their communities as well. Churches were a part of this organizational effort, too. Following the model used in other clubs, most churches adopted a way of doing things that feature committees and Robert's Rules. It was (and is) seen as an efficient way of processing decisions and implementing new ideas for the organization. And this model is fairly efficient...until it's not. There is a basic life-cycle to institutions. Cameron Trimble shared a helpful way to understand it at the UCC's General Synod a few years ago when presenting a workshop on church planting. When one is first getting started, there's a lot of energy as the people gather and begin to organize themselves. Then the organization begins developing programs and, if it has been effective at implementing them and people remain engaged, it can blossom into something wonderful. At that point, however, the energy level tends to taper off as the organization plateaus: it hits a stable point, and people may become overly comfortable in what they're doing. After a while, if there isn't something new to re-galvanize the people's energy, those programs decline and the organization becomes more preoccupied with administrivia than whatever core mission energized it to begin with. In other words, when an organization hits that downward slope, it becomes more concerned with the process of making decisions than actually making decisions, or it becomes concerned with making decisions about silly little things rather than the Big Things that got them together. Some of this, at least, may be about maintaining that comfort level that the organization has reached: it begins enjoying it a little too much, and it doesn't see the need to keep striving after what it needs to do next. 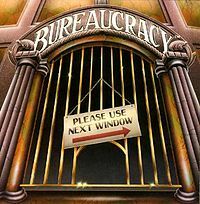 A word that gets tossed around a lot when people seek to deride institutions in general is "bureaucracy." Some just use it as a synonym for "institution." But a business-minded church member who is also familiar with this organizational life-cycle has shared with me that this term should be reserved for when an institution hits that downward slope toward irrelevance; that point where the community's life becomes more concerned with rules, regulations, and busywork than its earlier mission that used to energize the group into positive, difference-making action. Tony Jones, that reliable critic of mainline denominations (even though he owes much more to them than perhaps he realizes) chooses that term as he runs down the list of national church gatherings being held this summer. I followed the Presbyterian Church (USA)'s gathering with interest on Twitter, particularly as many younger members expressed dissatisfaction and despair over how things were playing out. One of the main gripes, I think, was about process: delegates seemed at times to be more concerned with administration and Getting The Process Right, or the process was way too convoluted to make people believe that they were there to do anything worthwhile. Another big critique shared was the lack of young voices allowed in the decision-making process, which was seen as the institution trying to maintain a comfort level that, long-term, it really can't afford to maintain. Having been a delegate to four General Synods of the United Church of Christ, I'm familiar with this frustration with and lack of faith in the institution. I've presided over decisions at the local church level that get caught on the little pointless things rather than the bigger picture. I get the criticism of institutions, as I've voiced it myself over the years. Well, the title of this is "In Defense of Institutions," so maybe I should defend them a little. Given the basic life-cycle of an institution, I submit that not every organization is an impenetrable, soul-sucking bureaucracy. Or at least it doesn't need to be. First off, there are reasons why institutions organize themselves at all, many of them worthwhile. Say you and a group of your friends want to serve the poor in some way. Do you immediately rush out to some inner city neighborhood, walk up to someone and say, "Hey, I want to help you?" I suppose you could do it that way, but the more likely process would probably involve your group (or, you may prefer, the core of what eventually will be a larger group) sitting in your living room tossing around ideas: Do you want to offer a food pantry or a free meal? Which neighborhood are you going to focus on? How are you going to let other people know what you're doing? Are you going to need to raise any money, and if so, how? Can you see your group's effort making much of a difference without asking questions like these, even if you want to engage in something small and simple? Maybe, but most likely not. My point is that the right amount of organization is needed in order for any sort of group effort like this to be worthwhile. Then later on, if what began in your living room as planning a relatively simple act of service begins to catch the hearts and minds of others who want to join your effort, you'll need to re-organize in order to accommodate them and expand what you're doing. There seems to be too much of a knee-jerk reaction to the very notion of organization; an attitude that any at all will be too stifling and spirit-crushing. In response, some like to say, "Let's just go serve, maaaaaaaaan," without much of a plan at all. I know, because I was like that for a while. But I now see and appreciate the value in planning and organizing, so long as the institution keeps itself from tipping into bureaucratic mode. I don't know whether denominations can be rescued from those more bureaucratic aspects of their existence. Like Jones, the hang-ups on that stuff make me sad. But for me, when an institution is monitoring itself intentionally, pursuing new things in order to continue making positive contributions to the world, it can be a worthwhile thing to be a part of. At other times, bureaucracies really do need to die in order to make room for something new. I think that it's safe to assume that hardly anybody sets out to create an institution full of overly complicated and seemingly pointless practices. It may be that most people don't set out to create an institution at all. But certain movements begun with just enough organization catch on and need re-tooling to address the changing dynamic both in its system and in its larger setting. 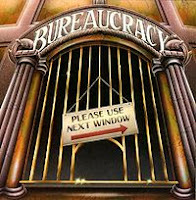 It's when this re-organization is absent that bureaucracy begins to set in and institutions really become a problem.